Plant Native - Blog - Bird Feeders Etc. Look at your neighbor’s lawn and garden. Do they constantly mow, water and apply chemicals and pesticides? Is their garden bright and beautiful, yet devoid of wildlife? Reality check: they’re doing it wrong. Biodiversity is extremely important to the environment, our communities, and most importantly, our selves. Sadly, it is often overlooked as many are uninformed and the immediate satisfaction of a colorful, pristine garden is much easier to appreciate. Homeowners, gardeners and landscapers can benefit birds and other wildlife by selecting native plants when making their landscaping decisions. Traditional landscaping uses large amounts of pesticides and fertilizers and contributes to air and noise pollution. Not only can these be harmful to wildlife, when you water your lawn or it rains, the chemicals are washed out into the water supply. On the other hand, once established, native plants usually require little maintenance. Native plants are adapted to the local environment and they require far less water which saves time, money and WATER. In addition, native plants are less susceptible to pests and diseases and are unlikely to become invasive. Native plants provide shelter from the weather and predators and offer habitats for many mammals like birds and insects. They also provide nectar for pollinators including hummingbirds, native bees, butterflies, moths and bats. The native nuts, seeds and fruits produced by these plants offer essential foods for all forms of wildlife. With birds in particular, native plants play a key role in the food chain. Insects evolved to feed on native plants and for the most part, birds raise their young on insects. Removing these plants and insects from the local environments means that survival is more challenging for the vast number of species affected by the lack of biodiversity. Example: Research by Doug Tallamy shows that a native oak tree supports over 500 species of caterpillars whereas ginkgos (common landscape tree from Asia) hosts only FIVE species of caterpillars. It takes over 6,000 caterpillars to raise one brood of chickadees. It’s extremely clear that native plants provide the food and shelter needed for local wildlife to thrive. Remember, we’re talking about native plants, which means the flowers, shrubs and trees that thrive on the west coast or down south may not be compatible with the soil and climate in the Midwest or on the east coast. Therefore, your best option is to check out a local nursery, arboretum or botanical garden. Try the link at the bottom of the post – The Wildflower Center established a database to help find the most compatible native plants for your yard. Tip: Don’t prune off the dead flowers – they provide food for hungry birds in the winter. Tip: Red berries (nearly 50% fat) are a great energy source for birds in late summer. Tip: Try a colorful Black-eyed Susan like the ‘Toto Rustic’ or ‘Sonora’. 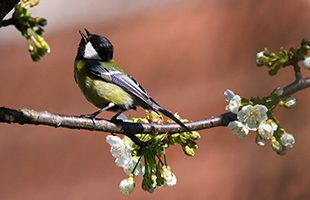 Tip: The birds will be very interested in the edible flowers and delicious berries! Tip: The Oak nuts may cause an increase in squirrels so be aware and prepared if you have feeders nearby.